You’ll see the perfectly coiffed Gouldian finch family having breakfast at sunrise in their Marimekko-cushioned nest and the kangaroo mum going shopping with her joeys with time for a nap! With cleverly hidden clocks and secondary animals in each scene, children are encouraged to immerse themselves in the colorful watercolors and adults will delight in humorous references to design icons and a loving depiction of the mixed modern family. Also includes scientifically accurate family facts glossary and design icons such as Featherstone chairs." Children's books have the ability to transport you to another time and place. I would so love to visit Australia, and for just a little while, on our couch we were able to travel there! A fantastic look at over 15 animals native to Australia. See what they eat, how they play, where they live and how they relate to each other. Some of the modern designs may get lost on the youngsters, but it does add an additional flare for the reader! Fantastic, detailed illustrations will make your child pause at each page to look over each page extra long. 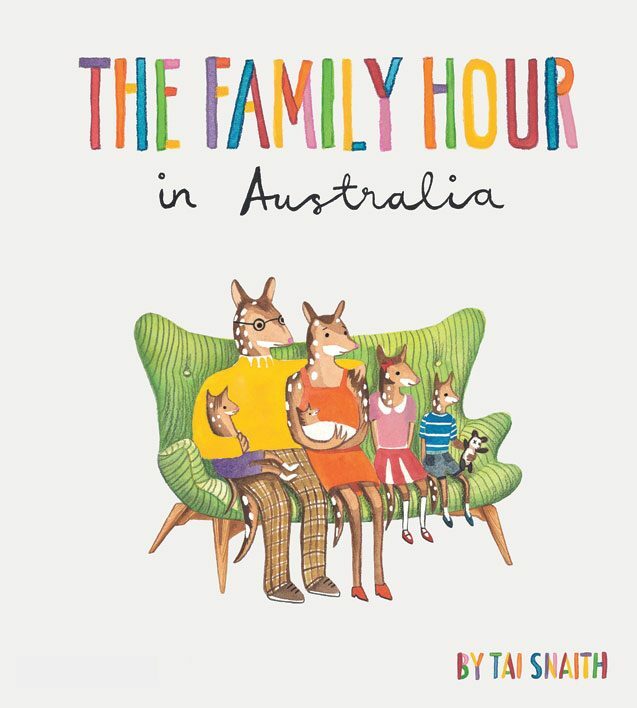 Enter to win a copy of The Family Hour in Australia to celebrate Children's Book Week! Thanks to Gibbs-Smith for sponsoring this giveaway! I'd love for it to transport me to space! I would love Ancient Egypt. I would love a children's book that transported me to Jerusalem to see what it was like in Jesus' time & what it is like now. I would like to be transported to space in a kids book! I would love to be transported to the beach! I'd like a book about Ireland. I would love to be transported in a book to Africa. Oh, I wish I could enter this one. We just visited Australia in March and my kids still talk about it every day. I'm in Canada, so I'll tweet about it instead. Thanks for joining us in the Hop. I would love to be transported to Finland.